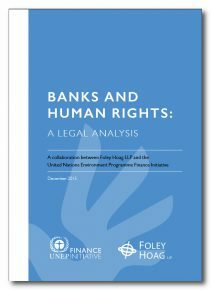 A collaboration between Foley Hoag LLP and UNEP FI, this research paper offers a legal analysis of the current banking and human rights landscape. The paper provides an overview of the United Nations Guiding Principles on Business and Human Rights, and explores their implications for the banking sector. It examines both hard law and soft law related to banking and human rights, as well as the relationship between the two. The paper contributes to wider thinking on how banks can address human rights issues.